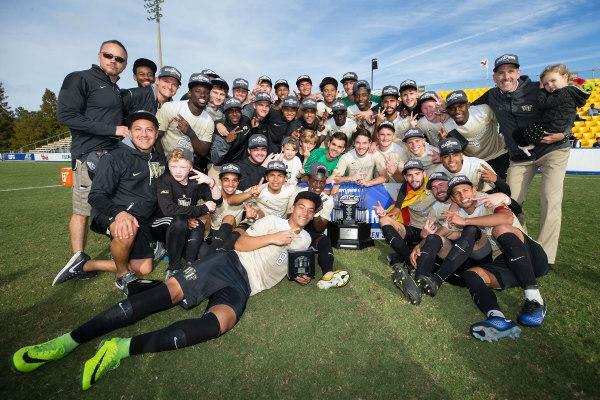 After a hard-fought battle against the University of Virginia that ended in penalty kicks on Nov. 12, the Demon Deacons claimed their third ACC Soccer championship in university history. Both teams approached the first few minutes of the game cautiously. UVA proposed a 5-4-1 scheme inviting the Demon Deacons to have the ball possession advantage, but overcrowded the passing lanes as Wake Forest crossed the midfield. As a result, Wake Forest dominated most of the ball possession of the first half but could not freely exchange passes on offense. UVA created counter-attack plays with the speed of forward Opoku through the sidelines and the offensive plays of midfielder Pablo Aguillar through the middle. Wake Forest created some good offensive plays after individual plays from sophomore Ema Twumasi and freshman Brendon Servania, but lacked the final touch on their shots to really pose any danger to Jeff Caldwell, UVA’s goalkeeper. In the 43rd minute, defender Logan Gdula committed his second yellow-card foul of the game, leading to his exit. Gdula attempted to stop a dangerous UVA counter-attack through the left sideline, but he clearly grabbed the UVA player. Wake Forest was therefore not able to run its advanced midfield. However, at the beginning of the second half, the Cavaliers changed their scheme to exploit their numeric advantage. UVA decided to avoid risks and stuck with their original game plan of being a defensive-minded team and eventually relying on Caldwell to win the game if penalty kicks were needed. This allowed Wake Forest the freedom to keep pushing the pace of the game and be more comfortable playing with a 10-man team. UVA focused on their own defensive side and did not take the initiative to attack. The result was a game tied 0-0 through regulation and two very static overtime periods. When the game came down to penalty kicks, UVA seemed to finally get what they wanted all afternoon — to have the game in the hands of their best player. It sure looked like it was going to work as Jeff Caldwell caught the first two penalty tries by Jon Bakero and Brendon Servania. With a 2-0 lead, Virginia looked poised to raise their 12th ACC championship. However, after a stop by Sophomore Andreu Cases Mundet (Sophomore), the Demon Deacons stormed back with three straight makes to regain the lead at the top of the fifth attempt. After Twumasi converted to give Wake Forest a 4-3 advantage and at the bottom of the six, Opoku missed his try making Wake Forest Back-to-Back ACC champions, the first time a team wins back-to-back since Maryland in 2013-14. Virginia’s HC decision to play conservatively was heavily questioned in the aftermath of the match. However, Jeff Caldwell is an outstanding goalie and had Virginia won he was the clear-cut MVP of the match. However, penalty kicks are exciting exactly because of the unpredictability factor in play. It makes sense to rely on that strategy when your team is clearly overmatched by the opponent, as Costa Rica did to eliminate Netherlands in the 2014 World Cup. Virginia was not able to take advantage of their numeric edge during the second half. Part of that was due to a great effort by a really deep Wake Forest team that once again kept composure after facing adversity early. Wake Forest did a better job adjusting to the situation, and this was the key to keep the balance of the game in their favor despite being one man down. After the win, Wake Forest was awarded the No. 1 overall seed for the NCAA tournament and waits to host the winner between William & Mary and Columbia in the first round. As the top team in the country, Wake Forest will host all the games on its way to the College Cup. Oddly enough, this path might lead to a possible rematch of last year’s College Cup final or a third match against division rival Clemson. Both teams stand at No. 9 and No. 8 respectively at the other side of the bracket and the two clear-cut favorites to face the Deacons should Wake Forest advance all the way to the quarterfinals. Wake Forest will host its first game College Cup game this Sunday, November 15, 5 p.m. at Spry Stadium. Stay tuned for more Wake Forest Soccer updates as the Demon Deacons pursue a back-to-back national championship apperance and the second national title in program history.